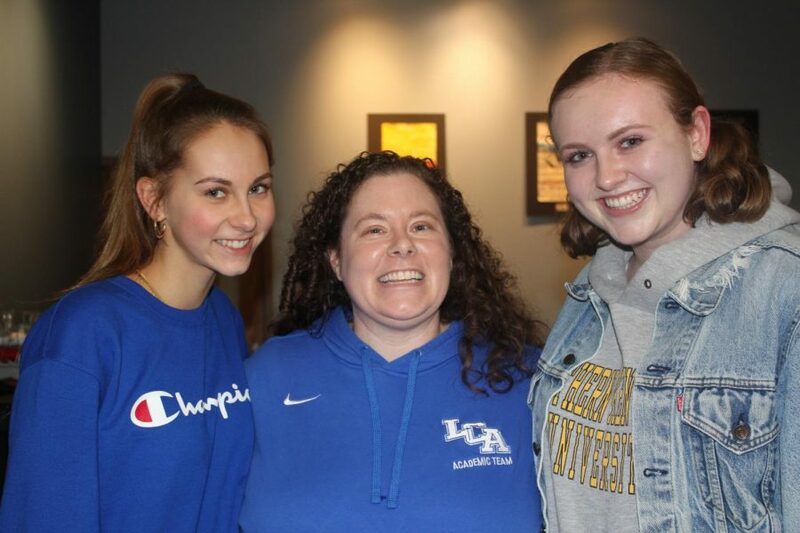 Erin Oliver, 12, and Hope Marcum, 12, pose with Ms. Groves who has developed a special relationship with many students during her tenure at LCA. One of the most dearly loved members of LCA’s faculty has just announced she is resigning from her position. Beth Groves, librarian and media center specialist, has decided to move on after nearly fifteen years of service to the school. Although students, faculty, and staff will miss her dearly, nearly everyone is excited to see her pursue her career at the university level. She has been given an amazing opportunity to work in the media center at Asbury University, a private Christian college in Wilmore. She will be leaving LCA by the end of February. Ms. Groves might be well- known around the school for all things books, technology, and Shakespeare. However, many students are not aware that Ms. Groves actually started as an English teacher. She has had a huge impact on LCA as the head of it’s competitive academic team as well as starting it’s first monthly book club. She also coordinates all of the study abroad leadership trips with Global Next. In addition, she helps with mission trips, hosts girls retreats, and provides a safe haven for students in the media center. To add to the list of her activities, she is a frequent chaperone to Y-Club conferences, including KYA and KUNA. In the past few years, she has organized trips to Louisville to see plays and hosted a few screenings of movies made from books. Her favorite memory at LCA has actually been getting to experience new countries with students. She has visited over twenty countries as a chaperone- her favorite being England. She also loved getting to travel to places that she wouldn’t have the chance to such as India and Africa. Ms. Groves has always been a trustworthy and entertaining mentor who is loved by both students and faculty. Her extensive knowledge of books and technology will certainly be missed; however, it’s her good-natured humor and selfless essence that will be hard to replace. After all, anyone with a passion for reading can be a librarian but it takes a truly special person to be the kind of mentor Ms. Groves has been to so many students.